Researchers at the University of Tokyo have developed a holographic projector that displays three-dimensional virtual objects you can feel with your bare hands. 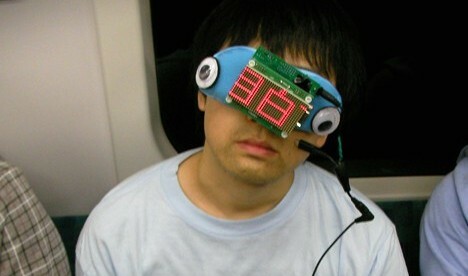 The system consists of a Holo display (developed by Provision Interactive Technologies), a pair of Wii Remotes that track the position of the user's hand in front of the screen, and an "Airborne Ultrasound Tactile Display" unit that shoots focused ultrasonic waves at the hand to create the sensation of pressure on the skin. By controlling the movement of these focused ultrasonic waves -- which can produce up to 1.6 grams-force of pressure within a 20-millimeter-wide focal point -- the projector can recreate virtual objects that seem to have physical mass. In the video above, the projector displays a tangible virtual bouncing ball, raindrops, and a small creature that runs around on the user's hand. The tangible hologram projector is now on display at SIGGRAPH 2009 in New Orleans. A 3-millimeter-thick digital booth babe is drawing double-takes in Tokyo. Spotted at the International Stationery and Office Products Fair, this eye-catching digital signage system consists of a 0.3-millimeter-thick high-luminance rear-projection film (Vikuiti Rear Projection Film developed by 3M) applied to a 3-millimeter-thick glass substrate cut into the shape of a woman. A rear projector beams video onto the film, whose microbead-arrayed surface produces a crisp, brilliant image viewable from any angle, even in brightly lit environments. IT company Kayac has teamed up with researchers from Keio University to develop a high-tech brainstorming room that listens to its inhabitants and feeds them a barrage of related data and images in order to boost creativity and fuel the imagination. 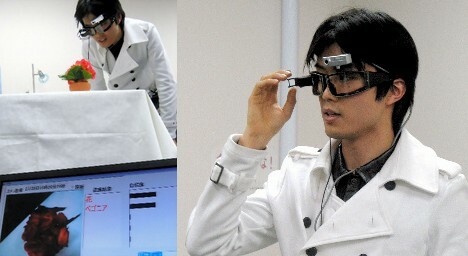 The system -- called "Kage Roi" -- relies on a speech-recognition capable computer that monitors the brainstorming session via microphone, identifies keywords, and automatically crawls the web in search of related information and images. 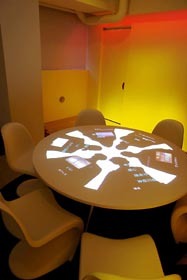 A ceiling-mounted projector then casts the retrieved data and imagery onto dark, human-shaped shadows on the table during the course of the meeting. The brainstormers can free-associate on the projected data, use it as a tool for discussion, or rely on it for helpful cues if ideas are running short. Kage Roi also features an ambient, multi-colored LED lighting system designed to stimulate creativity by altering the mood of the room. The "half-day course" setting, for example, simulates the rising and setting of the sun over the course of a 2-hour brainstorming session, helping to create a gradual mood shift as the meeting progresses. 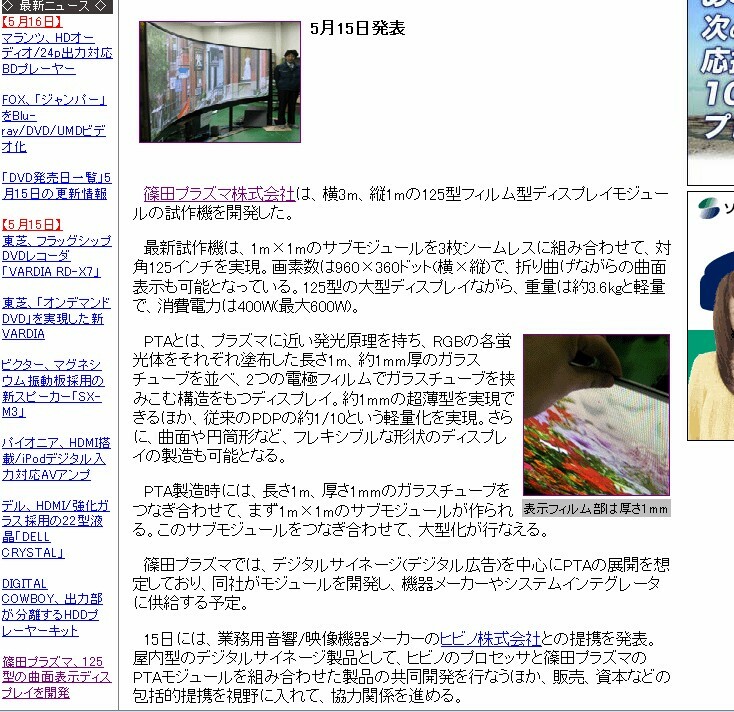 Kayac developed Kage Roi in cooperation with the Keio University Inakage Lab (imgl), whose research focuses on next-generation digital communication and entertainment. The system was installed in a meeting room at Kayac headquarters last month, and the company plans to begin field-testing it soon. Kayac hopes to develop a practical version of the system in the near future, and they are considering marketing it to companies in the content creation industry. Next-generation large-screen display manufacturer Shinoda Plasma has unveiled a flexible, 1-millimeter thick, 125-inch film-type prototype display that can be used as a curved or wrap-around screen. The 3 x 1 meter plasma tube array (PTA) display (which actually consists of 3 seamlessly integrated 1 x 1 meter square sub-modules) offers a resolution of 960 x 360 and weighs 3.6 kilograms (8 lbs), or about 10 times less than a conventional plasma display. At a low-key unveiling on May 15, Shinoda Plasma announced plans to exhibit the device in June at the InfoComm 2008 conference in Las Vegas and confirmed their intent to begin small-scale production of a 150-inch (3 x 2 meter) version this autumn. While Shinoda Plasma envisions a variety of digital signage and advertising applications, the ultrathin displays would also undoubtedly make good digital wallpaper for the home. 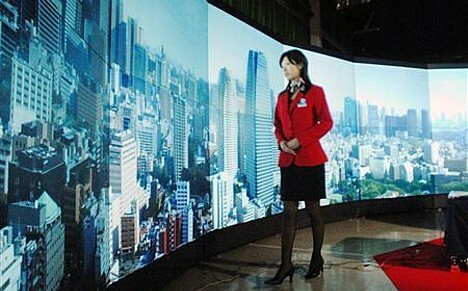 On October 31, Mitsubishi Electric unveiled a 2-meter tall, 7.5-meter diameter panoramic display system consisting of synchronized rear-projection displays arranged in a wall that encircles the viewer. The 150 million yen ($1.3 million) system, which was built-to-order at the company's Kyoto factory where it was unveiled, consists of 17 pairs of 67-inch panels arranged in a 340-degree near-circle -- the 20-degree gap presumably allows the viewer to enter and exit the walk-in display. The system uses Texas Instruments Digital Light Processing (DLP) technology and has a total resolution of 27 million (1024 x 768 x 34) pixels. At the unveiling, Mitsubishi said it will deliver the panoramic display system to the customer early next year, but the company was unwilling to say who the customer was or how they intend to use the display. However, Mitsubishi did say it hopes to begin selling the system as a virtual reality display for use at museums or in applications such as traffic simulations.